Next weekend I am attending Eat, Write, Retreat in Philadelphia. It’s the first conference this year that I am attending and I cannot be more excited. Attendees were invited to enter the Amazing Apps Culinary Challenge where they would be shipped a surprise ingredient to create a healthy appetizer. As an extra special bonus, entrants were also sent several OXO tools to aid in the creation of our dishes. My secret ingredient was a variety of potatoes from the The United States Potato Board (USPB). OXO also sent along a 3-in-1 Adjustable Potato Ricer and three of their graters- a Zester, Medium and Coarse graters. I am such a geek for new kitchen tools and I absolutely love OXO for their high quality, durable products, not to mention their Good Grips, which makes them so comfortable to use! Most people think of potatoes as they do rice, a relatively boring side dish, a starch that often needs to be complimented by another vegetable. But in reality, potatoes are incredibly versatile and can stand alone on a plate. They are also very healthy, at just 110 calories for a medium sized potato and packed with vitamin C. Did you know, if eaten with the skin on, a potato has more potassium than a banana? Well, it does- one of the fun facts I learned from reading the materials that were sent along with the potatoes. Also, potatoes are completely FAT-FREE! That fact alone should make them even more appealing for adding them to your diet. They already are one of my most favorite foods. Because they are so versatile, it took me a long time to narrow it down to just one idea for this challenge. 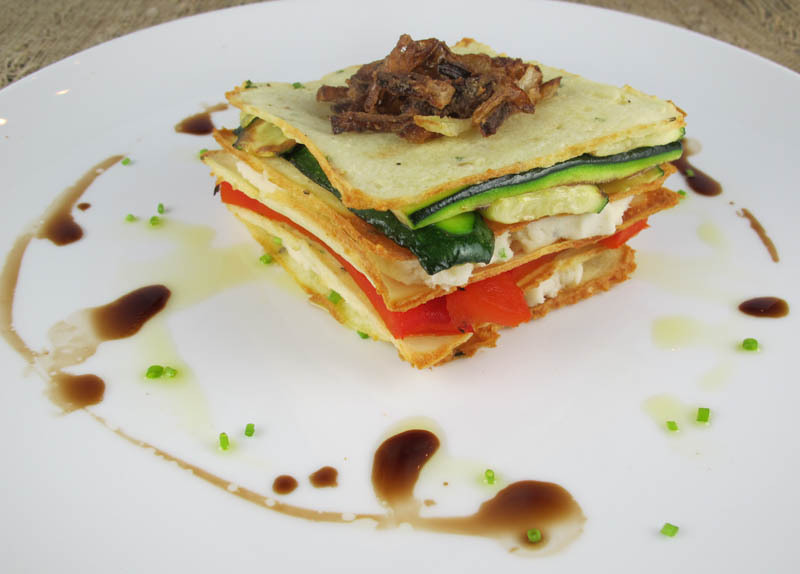 In the end, I combined many of my favorite flavors to make one incredible stack of potato goodness, a Potato Crisp, Roasted Vegetable, and Herbed Goat Cheese Napoleon. Peel and chop potatoes. Boil until soft. 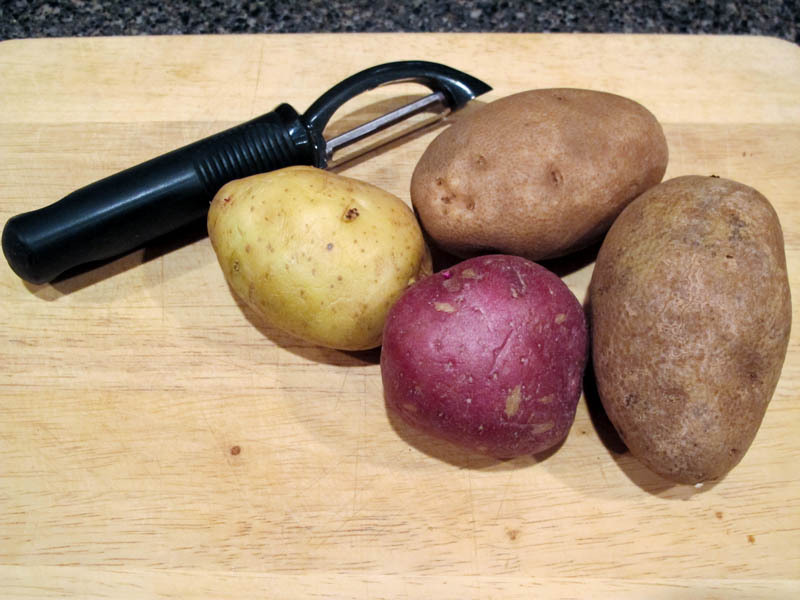 Pass the potatoes through the OXO 3-in 1 Adjustable Potato Ricer into a large bowl. Add butter, egg whites, heavy cream and chives. Fold in until smooth but gently so as not to create a gummy mixture. Using the OXO Medium Grater, grate Parmesan cheese directly into the potato mixture. Fold in without over working the potatoes. Create a template out of a thin piece of cardboard (part of a pizza box lid works great!) by cutting a 3"x 3"square from the middle. Place the template on a silicone baking mat. With a spatula, spread an even layer of potato over the template. Remove the template and there will be a square of mashed potato on your mat. Repeat until you have 20 squares. Bake the squares for 8-10 minutes, being careful that they do not get too brown. Prepare the fried onions by dredging the onion slices lightly in the flour and then frying in the vegetable oil over medium heat until brown and crisp. Drain on paper towels and set aside until ready to use. 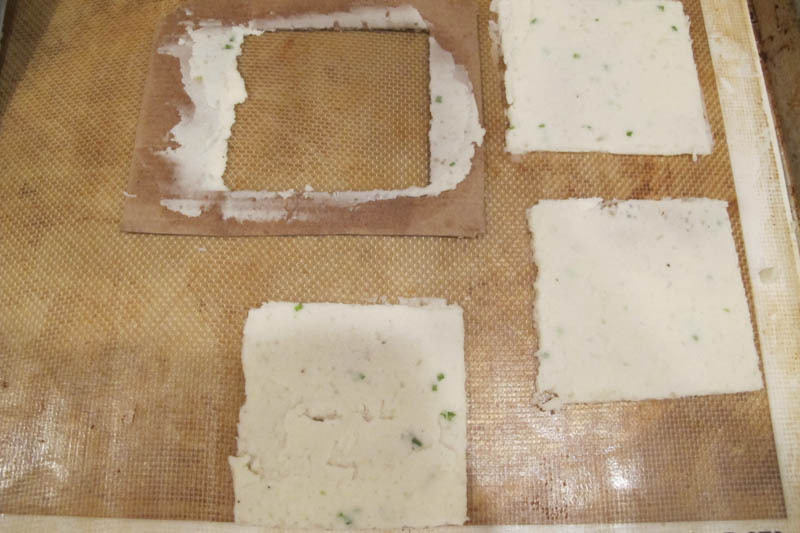 On a plate, lay down one crisp, add a layer of herbed goat cheese, followed by another crisp. Add a layer of red peppers followed by another crisp. Add a layer of herbed goat cheese followed by a crisp. Add the zucchini layer and a crisp. Top with the fried onions. Drizzle with olive oil and Balsamic vinegar and serve to many "oohs and ah's" from your guests. 1. Peel and chop potatoes. Boil until soft. 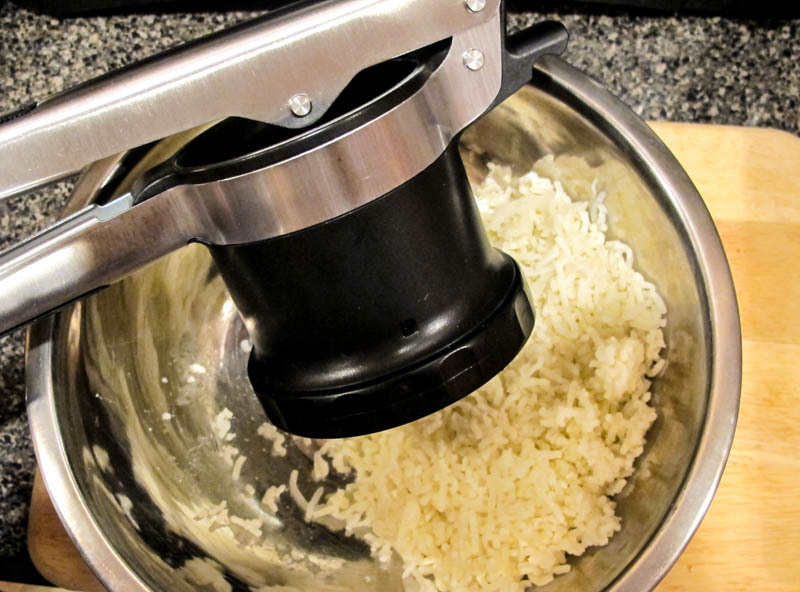 Pass the potatoes through the OXO 3-in 1 Adjustable Potato Ricer into a large bowl. 2. Add butter, egg whites, heavy cream and chives. Fold in until smooth but gently so as not to create a gummy mixture. 3. 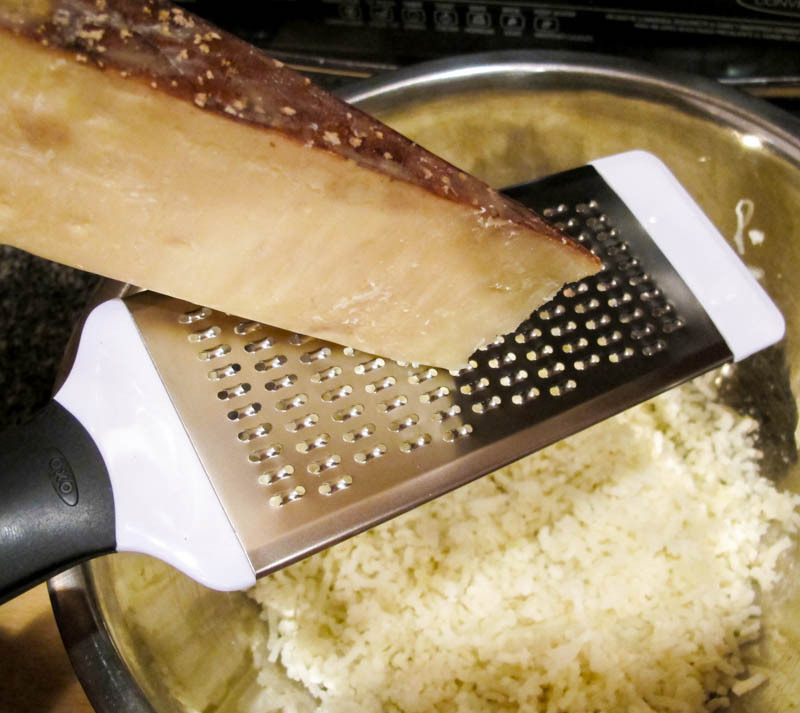 Using the OXO Medium Grater, grate Parmesan cheese directly into the potato mixture. Fold in without over working the potatoes. 4. Preheat oven to 400 degrees F.
5. Create a template out of a thin piece of cardboard (part of a pizza box lid works great!) by cutting a 3″x 3″square from the middle. Place the template on a silicone baking mat. With a spatula, spread an even layer of potato over the template. Remove the template and there will be a square of mashed potato on your mat. Repeat until you have 20 squares. 6. Bake the squares for 8-10 minutes, being careful that they do not get too brown. 7. Remove from oven and cool. 8. Prepare the fried onions by dredging the onion slices lightly in the flour and then frying in the vegetable oil over medium heat until brown and crisp. Drain on paper towels and set aside until ready to use. Drizzle with olive oil and Balsamic vinegar and serve to many “oohs and ah’s” from your guests. 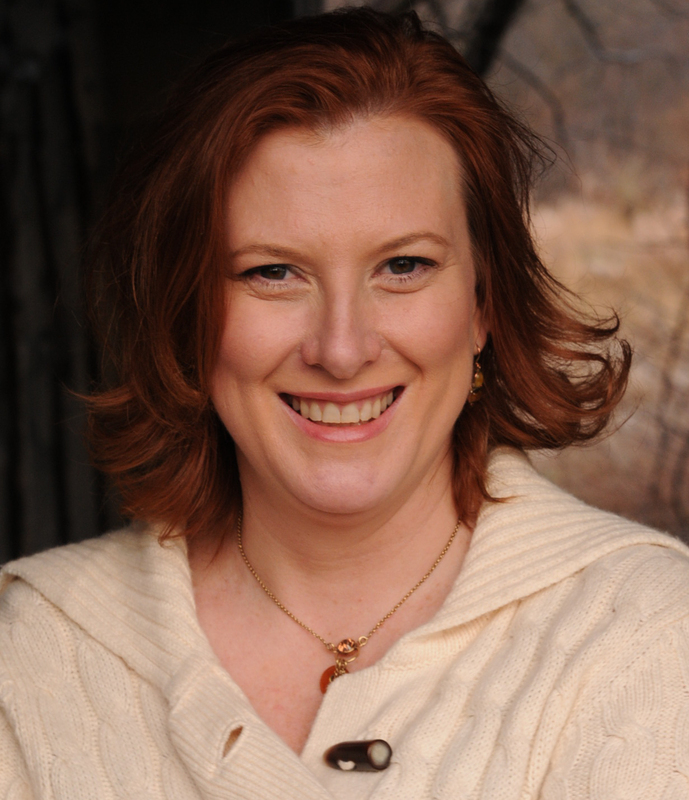 Disclosure: As an Eat Write Retreat registrant, I received samples from The U.S. Potato Board and a variety of OXO tools to help create this recipe. With this post I am eligible to win prizes in the Amazing Apps Culinary Challenge. All thoughts and opinions are my own with a big shout out ‘Thank You’ to OXO for the awesome tools! This is so original and eye-catching. Wow! I am looking forward to meeting you at the conference. Nice appetizer! This would be a great start to a sit down dinner with family or friends! Best of luck in the challenge – I got potatoes as well (so fun)! Hope to meet you at EWR!! Oh my, this looks good! Simply beautiful. Look forward to meeting you in Philly.